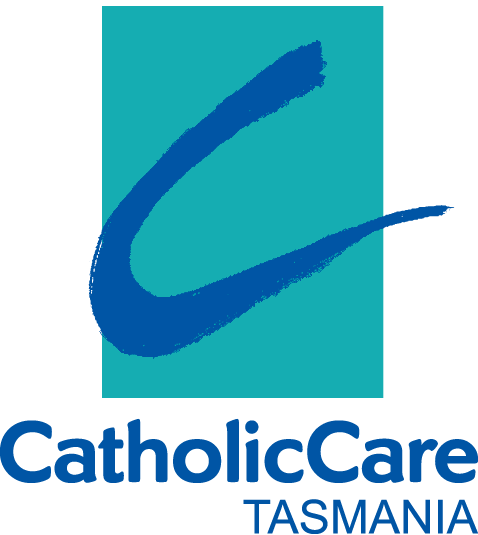 CatholicCare Tasmania responds to individuals, families, and the community by offering a broad range of specialised professional services available to all. Our particular strength is in our family focused, child centred approach, recognising that whatever impacts on family, also impacts on children. We respect the dignity and worth of every person irrespective of background and circumstances, from the moment of conception to life’s natural end. We embrace difference and empower every person to shape his or her destiny. We see strength in every person and believe that everyone can grow and build a positive future. We build relationships with those whom we serve and stand by them through the good times and bad. We dedicate ourselves to enhancing their rights and interests. We maintain the highest ethical standards and act with integrity in all we do. We are accountable to the Tasmanian communities we serve, to those who provide our funding, and to each other. We take responsibility for continually learning and improving. We learn from and act on, proven evidence. We maintain the highest standards, and initiate and pursue innovative and best practice approaches to managing change in people’s lives. We strive for fairness, equity and opportunity for all. We take time to care. We speak up for and give voice to, those who are vulnerable, protect the poor and the oppressed, and promote peace and human rights for everyone in our society. PDF version of the 2014 - 2015 Annual Report. Centacare Tasmania was established in 1960 by Archbishop Sir Guilford Young. The Tasmanian Marriage Guidance Council’s policy decision to change the Constitution so that scientific contraception would be promoted and taught as part of the work of the Council. Up till this time, the Council had operated as an ecumenical venture. 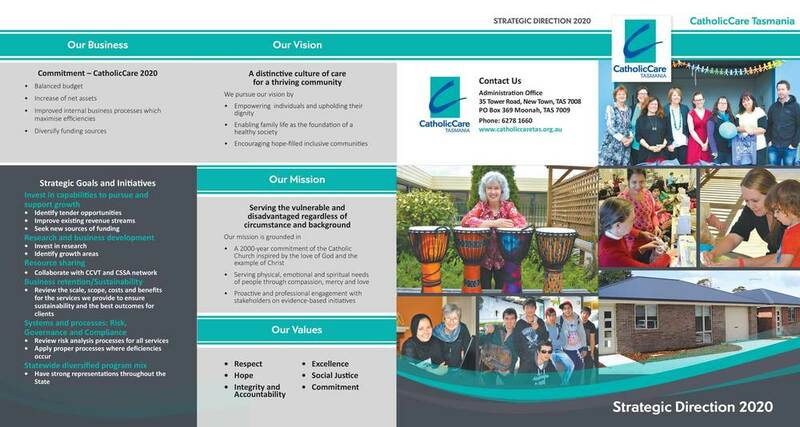 Following the policy change, the Archdiocese ceased formal involvement with the organisation. The introduction of the Matrimonial Causes Bill in 1959, by the Menzies Government. This was an attempt to reform the various State Divorce laws and make uniform Australian Divorce legislation. The Bill also included a proviso for the funding of Marriage Counselling Agencies in Australia. Fr Eric Perkins, Director of the Catholic Family Welfare Bureau (CFWB), Melbourne (est. 1936) and Monsignor J F McCosker, Director of the CFWB, Sydney (est 1941), had campaigned vigorously for the Government to include the allocation of monies for the support of marriage counselling, in the proposed legislation. It was generally accepted amongst the Churches that divorce was a social reality and as such, should be legislated for. The Catholic Church had a definite interest in supporting the institution of marriage and the protection of the family. Frs Perkins and McCosker sought a mandate from the Australian Catholic Bishops Conference to form a committee and have a Bishop appointed as a Deputy for Welfare. The National Catholic Welfare Committee (later to become the Australian Catholic Social Welfare Commission) came into being. One of the earlier recommendations of Fr Perkins, now speaking on behalf of the NCWC, was that the new legislation should provide for and fund community services in family and marriage counselling. The question of subsidisation for marriage counselling services was not received enthusiastically by the Government where expenditure was limited as far as possible to Government ventures and it appeared to create an unhealthy and expensive precedent. While the Government asserted that pressure coming from cohorts of controlled Christians should be ignored, concession was eventually made that some support would be given to the NCWC proposal. The Federal Opposition of the time referred to the Government’s decision regarding marriage counselling subsidies as a “sop to the Churches”. In 1959, Frs Perkins and McCosker addressed the Bishops’ Conference. They briefed the Bishops on the content of the new Bill and advised them that the Attorney General (Sir Garfield Barwick), had agreed that the Government would provide subsidies for Marriage Counselling services. They urged each Bishop to establish a family welfare agency in his own diocese to develop services for families and also also conduct marriage counselling. The Matrimonial Causes Bill passed into Australian Law in December 1959, however, the original allocation of approximately £120,000 was extremely modest, given the universal need in the community for expert assistance in human relationships. In December 1959, Archbishop Young appointed Fr Clem Kilby, at that time a Curate in the New Norfolk Parish, to set up a Marriage Counselling and Family Welfare Centre, initially known as the Catholic Family Welfare Bureau (1960 –1977). Establishment and all running costs of the CFWB were to be met by the diocese until the subsidy for marriage counselling was known. Even then, any shortfall in income would remain a diocesan responsibility. The unknown future of the new work seemed assured and for the first three years, the Bureau was located in a room on the first floor of the Church Office in Macquarie Street. By early 1963, a large debt incurred by one of the parishes placed extreme pressure on the financial resources of the Diocese. The CFWB Director was advised that the Diocesan costs of £1,500 for the establishment of the Bureau had to be repaid at 1.5% from the Commonwealth Government Grant and fund raising. Meantime, the accommodation at the Church Office was proving to be ill-suited to meet the needs of the new work and the Bureau moved to a property made available by the Sisters of Charity, at 11 Harrington Street (later known as 44 Sandy Bay Road, where it remained until 1988). Fund raising was of critical importance from the beginning and the Director formed a Welfare Auxiliary in 1962. The task was to raise monies to cover the running costs, wages of a full-time secretary and ultimately a social worker. During the most crucial years of its establishment, through street stalls, Art Unions, bingo nights and raffles, the Auxiliary became the life line of the organisation.